A new school year has begun – and anyone who has been out on the roads this week will have noticed the rise in traffic. For many kids, the new year means a new school. Amongst the nerves, the fussing over the new uniform, the worries about making new friends; there’s the big question of travel – how can my child get to the new school safely? Some may be thinking of cycling to the new school – if that’s you then check out our cycle route planner – CycleStreets – at http://richmond.cyclestreets.net (there’s also an app too for iPad, iPhone, Android, Blackberry and Windows mobile devices). All the schools in the borough are now on CycleStreets, as are most of those in the surrounding boroughs. This means you can just search for the school by its name, pop in your home post code as the start point, and CycleStreets will give you a choice of three routes: “Fast” (which will tend to use the main roads); “Quiet” (which will seek to use quiet streets and segregated paths wherever possible) and “Balanced” (which is mid way between the two). The routing logic takes into account many data sources and generally comes up with pretty good routes. The “Quiet” routes are particularly good – I have been cycling round this area for nearly 20 years and think I know all the back-routes; but am still often surprised and impressed by the quiet routes that CycleStreets suggests. Richmond has a wealth of pleasant leisure routes; but all too often potential quiet routes to places people really want to get to – such as schools – are cut off by busy roads with poor or no provision for cycling, turning a journey that should be simple into a stressful, unpleasant and inconvenient experience. We think this is one of the main blockers to increasing cycling rates in the borough. We are cataloging them on CycleScape – at http://richmondlcc.cyclescape.org/ – and you can too. So if there is particular road or junction that stops you choosing to cycle to school – please take a moment to map it on there and add it to our knowledge base. 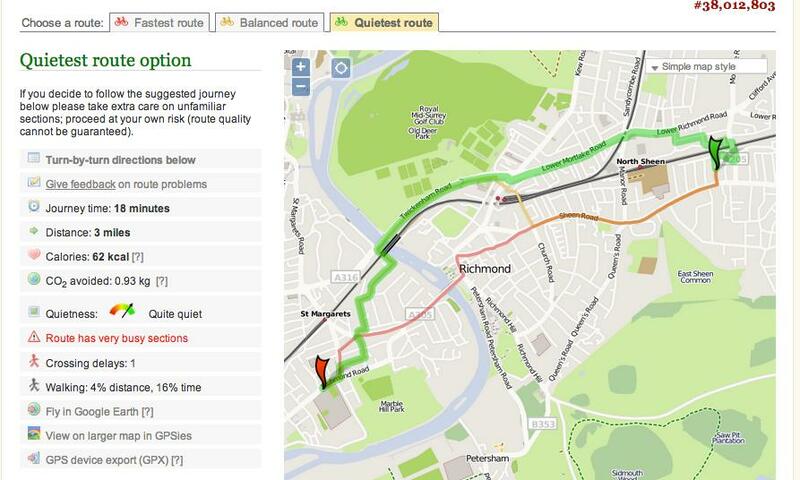 Alternatively just let us know via our website or on twitter – @RichmondCycling. As a parent, letting a child out on our streets on a bike is not an easy decision, and for many the lack of subjective safety is enough to stop kids cycling to school. This is evidenced in school travel plans – for example at the Richmond primary school my children attend, a whole school travel survey found that 23% of kids arrived by car and 7.5% by bike; but when asked how they would LIKE to come to school only only 16% answered “by car” – and 25% said they wanted to cycle. David Hembrow’s recent analysis of TFL travel data suggests that London households with children make up to 60% more trips per day by car than the average household – which goes a long way to explaining that big rise in term-time traffic; and will resonate with many local parents who are shuttling their charges from schools to all those after-school clubs and then back home again. But is this lifestyle providing a subtle cocoon around our children, that stunts the growth of their independence and turns them into couch potatoes? On a recent holiday to Norway I was struck with how kids as young as 6 and 7 took themselves to school; many by bicycle – and it’s a similar story in Holland, Sweden, Denmark and Finland – all of which sit at the top of the international index for Childhood Wellbeing and all of which also have high cycling rates. It doesn’t have to be this way in the UK. Many other cities around the world are waking up to the benefits of providing better cycling infrastructure; and are implementing improvements. Meanwhile, many fine words are being spoken in Parliament, the London Assembly and elsewhere about how we should improve things – and in places such as Brighton, Camden, and Bristol, some progress is being made on the ground. For the London Borough of Richmond, the latest steps forward are pinned to the council’s “mini-holland” bid – which has made it through to the next round of the bid process. However, the bid as it stands is woefully short on detail of how it might make everyday cycling – like the school run – appealing to the parents of Richmond borough; and we think it needs significant work in this area. This entry was posted in Campaign and tagged schools by acwoodward. Bookmark the permalink.